​is the 'Top of the line' Kontakt synthesizer from CL-Projects. Based on a well known polyphonic synthesizer from the late 90's that was capable of emulating Minimoog, Jupiter 8, Juno 106 and ARP 2600 sounds. The Hypernova Kontakt synth is no different. It can also emulate classic synthesizer sounds, making use of sampling technology instead of the virtual analog and substractive technology the original synth used. Hypernova is a 3 oscillator synthesizer which uses 50 different sound sets per oscillator. The sounds were sampled without the filter, LFO and effects settings. All the sounds were recreated with the Kontakt's filters, LFO's and effects. 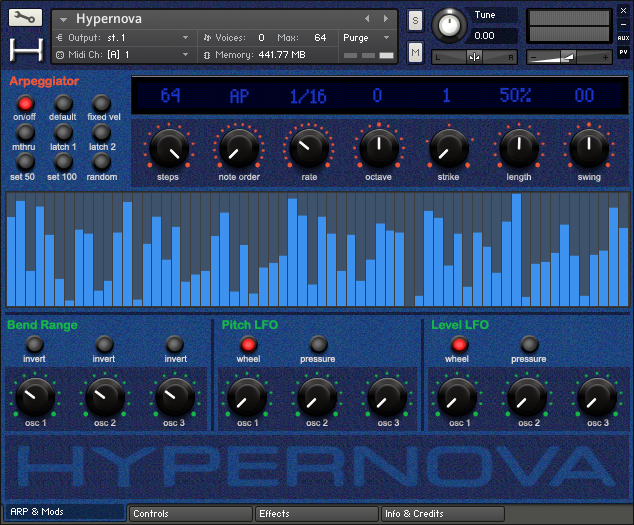 Hypernova is therefore an ideal tool for sound designers and musicians who want to make their own sounds. ​​contains the parameters to completely alter and edit the sound. The Hypernova synthesizer has a 3 oscillator architecture. All the parameters on the controls page are available for the 3 oscillators seperately. Four different waveforms can be selected for each oscillator: square, saw, noise and special. The special waveform is a choice between 50 different waveforms, selectable via a menu. Each oscillator has level, pan, tuning and modulationparameters. The global section contains the parameters that affects all three oscillators at once. On the the top left are the poly, solo, legato and offset settings with the possibility to change the note order in which the notes are played when set to solo, legato or offset: last, next, low and high. On the top right you can find the Portamento and Unisono parameters. The filter section contains 5 different filters of which 4 are ladder filters known for their Moog like character and the fifth filter is the well known Pro53 filter. Each filter has its own frequency and resonance setting, also accompanied with their modulation settings for velocity, modwheel, pressure and key track. The envelopes section contains three different envelopes for amp, filter and pitch each with their own presets. Last but not least there is a very extensive LFO section. Each oscillator has an LFO for pitch, filter, level and pan with a choice between four different waveforms: square, saw, tri (triangle) and s/h (sample and hold). ​​contains 7 different effects. A convolution reverb with a choice between 7 different spaces:chamber, room, hall, church, plate, spring and gate. Other effects are delay, chorus, flanger, phaser, distortion and a 3-band equalizer, each with their own effect presets. ​exists out of a 64 step arpeggiator with a random arp generator. Beneath the arpeggiator there's a small mod section where you can change the bend range, the pitch LFO and level LFO sensitivity for the modwheel and pressure for the three oscillators. ​"What is Hypernova? I’m back with another product from CL-Projects, this is the same developer that created the JD-850. This one is based on the Novation Supernova, which I’ve actually owned a couple of times, so I was really excited to check it out! It’s got 3 oscillators, each with it’s own settings for filter, envelope, effects, etc. There’s also a built in arp and modulation section, along with plenty of presets to keep you busy. He definitely aimed to capture the vibe and character of this classic synthesizer. How does it sound? He did a good job capturing the sound of this synthesizer, especially in the pads, which were some of my favorite sounds to pull out of this engine. Not just the pads though, leads, brass, strings, and even fx all have a great sound quality to them. Being able to quickly adjust your sounds within the interface really makes it feel like and instrument and not just a static library of samples. The arp allows you to spice up the sound while not being overly complex, which is always a good thing in my opinion. Overall I really dig the sound of this library, brings back a lot of memories for me! So what’s the bottom line? If you’re looking for a great new source of usable synth sounds with a tweakable interface I don’t see how you could pass up on this library. The pads alone are worth the price, but the fact that you have access to 3 oscillators including the “special” oscillators made up of 50 different waveforms, makes for a very powerful synth. I give Hypernova 4 out of 5 subs, the sound is great and the interface is super easy to use making it a very capable instrument." Well, as much as I liked Blue Orb, it’s all but forgotten to me now that I’ve experienced Hypernova. This may be [spoiler alert!] my favorite package of Kontakt electronica I’ve experienced yet. The sounds in this package were all captured from a Novation Supernova II Platinum X (the 48 voice version, not that that’s significant), pictured immediately above. The Supernova II has three oscillators. CL-Projects created custom sounds for the hardware synth, but mostly kept filters and modulations out of the picture, deferring those manipulations to filters and LFOs in Kontakt. And what a diverse set of sounds they are. There are 157 of them in to be precise in the form of sample sets recorded with impeccable precision and detail. Like the original instrument, the Hypernova library presents an instrument with three oscillators. Each has a basic saw wave square wave and noise provided, but the three saw waves and three square waves are all unique, just as was the case on the original instrument. Then, each oscillator has 50 “special” sound selections. These are all custom-programmed original sounds. The list for each oscillator is different. What results from all of this is a walk in the park for anyone who desires to do significant sound design but hasn’t developed the deep skills to make interesting sounds from the ground up. The story is actually pretty simple. Starting with one of the sample sets, pick a sound. Then use the oscillator’s associated filter, envelopes and LFOs to tailor the sound. One need possess only elementary sound design knowledge to come up with stunning results. And then there are FX to be added and an arpeggiator to bring into the picture, should that be part of the game plan. We’ll get back to these extras shortly. In the UI , you can see the main interface page. But think of it as three identical separate tabs, selected by clicking one of the three “osc” buttons. From that point everything else on the page belongs to that oscillator. Thus, a filter setting can be dialed in, for example. But if you wish to layer two or three sounds, the other oscillators can be given very different filter characteristics and behavior. Since rich and satisfying sounds can be created using just a single oscillator (and some of the factory presets ably demonstrate this), you don’t have to stretch your imagination to envision what stacked sounds can do. And then, there’s always the possibility of expanding into multi-s if your appetite for sonic complexity is still not satisfied. The oscillator sound is selected by clicking the “square”, “saw”, “noise” or “special” buttons. When using the latter, a menu of 50 choices is presented. Immediately below the sound selection area are the self-explanatory controls for level, etc. Once again, these are settable on a per-oscillator basis. The only significant limitation comes when you would like to layer two or more sounds from the same list. But the solution is easy enough – just create a Kontakt multi preset. Modulation of the basic sound is completely straight forward. We can influence the level with velocity, mod wheel, channel pressure and key tracking (a little goes a long way on this one). We can also invert any of these, permitting a velocity-controlled crossfade between two oscillators if desired – piece of cake! Individual ADSR envelopes are available for modulating amplitude and pitch. Likewise, individual LFOs can modulate amplitude, pitch and panorama. Each has individually settable sensitivity, speed and delay. And, again, these control just the oscillator currently in view. Each oscillator has its own full complement of modulation accoutrement. Next let’s consider the filters. There are five possibilities: low, band and high-pass ladder-modelled filters (the four-pole versions). Then there’s the Kontakt legacy low-pass filter. And I’m delighted to say that the vintage Pro53-modeled picture completes the picture. This was an area that I thought was one of the few deficiencies in the Blue Orb instruments. The “frequency” and “resonance” controls do just what you expect. The “gain” control allows you to supply make-up gain in case the filter attenuates the signal too much. The “sense” control dictates to what extent the envelope modulates the cutoff. Filter modulation is once again easily grasped. We can modulate frequency using velocity, mod wheel, channel pressure and/or key-track. I’m especially pleased to see key-track modulation control being present right there on the UI. Easy does it with that one, however. If you want the frequency to exactly follow the note number (and you would rarely want it be any more than that), a setting of 9 o’clock or slightly less is all that’s needed to get the job done.Finally, filter frequency modulation has an envelope and an LFO to call upon, dedicated to the current oscillator only. At the global level, we have the fairly standard Kontakt portamento and Unisono capability within easy reach.Everything you need to create a sound layer is right there in front of you. Add to that the marvelous sounds on offer, and you too can be a world class sound designer with a minimum of effort. How could it be any easier? Actually, there are several rather minor things. For one, it would be really convenient to at least have a capability for controlling oscillator level mix without having to constantly jump between the individual oscillator tabs. The other issue is vibrato. If you have a preset using more than one oscillator and want a unified vibrato across the multiple oscillators, it’s all but impossible to get two or three different LFOs to sync up or at least stay synced for very long. An option to control pitch of all oscillators with a single LFO would have solved this (that’s not to say that out-of-sync pitch oscillation is always a bad thing, by the way). But in the end, these are certainly not major complaints in light of everything here that makes effective sound design so effortless. Let’s briefly touch on the FX, everything being found on the effects tab shown above. These are shared by all three oscillators, as would be expected. We have Reverb, Chorus, Delay, Distortion, a 3-band EQ, a Flanger, and a Phaser. The Hypernova FX use standard Kontakt capabilities. These are all perfectly adequate, and they will get the job done just fine. I just don’t think they merit a lot of discussion. Finally, let’s look at the Apreggiator tab. OK, there’s an arp, and it’s Kontakt standard issue. If you are in the camp of musicians who like and use such things, this one is plenty capable. If you aren’t in that camp, you’ll just ignore it as I normally do. Same story as usual. Even if you don’t use arps in your music, they can be fun for just noodling around and can make for great preset demos. A more confusing aspect of this tab lies in the bottom portion. We can specify a pitch bend range independently for each oscillator (and cause pitch to bend in different directions, at that). That part is easy enough to grasp. But to the right are the Pitch LFO and Level LFO sections. What’s going on here – did we not cover this all on the Controls tab? Well, no, not quite. I suspect that the designer just ran out of UI space on the main page and could not add these controls where they would have been more logical. What we have here is the place in which you can set the level of influence that the mod wheel and aftertouch have on the pitch LFO (vibrato) and the level LFO (tremolo). It’s probably abundantly clear that I’m a huge fan of CL-Projects in general and Hypernova in particular. But I would be remiss not to mention one thing I experienced (and apparently only I experienced). A very small number of the samples (individual ones, not entire sample sets) did not loop properly. CL-Projects was not able to duplicate this behavior and reported that none of the other Hypernova users have reported problems. So, I must assume this small glitch is local to my DAW. Bottom line: do not let my mention of this issue influence your purchase decision, but should you experience something similar, I’m sure CL-Projects will want your cooperation in identifying the cause. So, that about does it. If you like rich, analogue-sounding synth sounds and you want to give the impression that you’re a masterful sound designer, then you’ve found a marvelous resource in Hypernova. At $49.99, this is almost a no-brainer. Well, done, CL-Projects!" Pretty sweet sounds right?! Yea, this thing is pretty wild. The sounds it can get are perfect for all kinds of music from Ambient to House, New Age or even Cinematic stuff. Whatever kind of music you’re making, the instruments fit right in and are sharp, full and beautiful. Jumping right into the controls page (the top image), you’ll see tons of options for getting the sounds you want. Having all those knobs staring at you right in the beginning could be a little intimidating for a synth novice, so luckily this package comes with 360 total patches (236 are straight insturments and 124 multis). There’s also a great expansion pack called Pulsar Project from SubsonicArtz (whose Omnisphere expansion pack GAIA I’ll be reviewing in a future This Thing Rules segment) which adds 100 more FREE patches… I could be wrong, but I think this could be the first time I’ve seen an expansion pack for a Kontakt instrument… Anything that gets me more inspiring starting points though is awesome in my book. There are also plenty of effects included in Hypernova. The effects page features pretty much all the options you could want from Reverb & Delay to Distortion and Phaser. Having little preset buttons laid out really lets you quickly try some settings out, before really twisting the knobs up and getting crazy. It’s also got some great ARP settings, which you know I always enjoy. So on to the included sounds! Some of what you’re hearing in “Lost In Spaces” are sounds I either created or edited using various patches at starting points. I also used a bunch of the included patches as is to great effect. The arp that kicks in with the beat is a multi called “Black Eagle,” and speaking of the beat, that huge kick drum comes from a patch called “Devil’s Drums.” A fitting name for such a menacing drum kit (something I really didn’t expect to be included at all since this is mainly a synth instrument, but having a few drum kits added in is a nice touch). The big beautiful reverb heavy keys are actually a multi from the Pulsar Project called “3 Stars System.” Another great patch is the awesomely Depeche Mode style bass/key combo of the “Electric Dream” multi. If it seems like I used a lot of multis, that’s because I did. While these sounds all sound great on their own and are hugely customizable, stacking multis really makes Hypernova shine. Back to creating sounds, there are a ton of options, but as you know, I don’t really dig too heavy into the details of the power-user stuff with these This Thing Rules reviews… These are meant to be more of a basic overview, along with the original track to make sure you get an idea of what you’re getting. But with that said, there is plenty to keep even the most hard-core synth nerd busy. I do wish that this would have been an officially licensed Kontakt instrument so you don’t have to browse through files to get to it, but that’s more of an issue with my own laziness than the software itself (haha). Hypernova is available now at CL-Projects store for $49.99. That’s a fraction of the cost of some of the “top of the line” competing synth VSTs, and definitely worth a look." "The Facts. 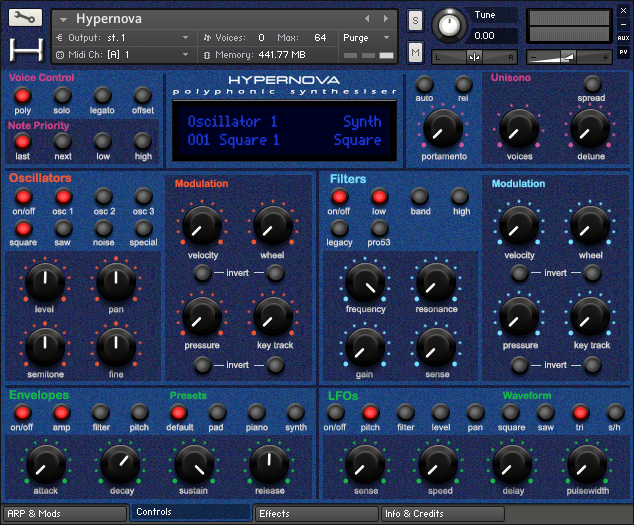 Hypernova by CL-Projects is a Polyphonic Synthesiser based on a well known polyphonic synthesizer from the late 90’s. It is capable of emulating Minimoog, Jupiter 8, Juno 106 and ARP 2600 sounds easily and comes with 360 patches, 236 instruments (nki) and 124 multis (nkm). The library downloads as 970 MB and all samples used for the instruments are 24bit /44.1k. Each of the kontakt patches uses 36 samples per instrument with 3 oscillators. There are 5 different filters including 4 ladder filters and a Pro53 filter. Hypernova syncs to your DAW host tempo contains a load of effects including Reverb, Delay, Chorus, Flanger, Phaser, Distortion, 3-Band EQ as well as a power arpeggiator with LFO/modulation parameters. Hypernova contains both velocity and aftertouch response. Hypernova is compatible with the full version of Kontakt 5.3 or higher. The Effects Page. The effects page contains 7 different effects. A convolution reverb with a choice between 7 different Impulse response spaces including chamber, room, hall, church, plate, spring and gate. Other effects are delay, chorus, flanger, phaser, distortion and a 3-band equalizer, each with their own effect presets. The ARP & MODS Page. The ARP & MODS Page gives you a 64 step arpeggiator which also includes a random button. Beneath the arpeggiator you have a set of ocillators that will let you adjust pitch bend, pitch LFO as well as the level LFO. Each of these has sensitivity settings for both the modwheel and for pressure settings for the three oscillators." Michel Huygen / Neuronium: "I have just added this to my virtual instruments, a new instrument called HYPERNOVA by CL-Projects Sound Design and let me say how wonderful, powerful and beautiful sounding it is. It has as main target to emulate the ¨things ¨that the Nova and Supernova synths in the 90's were doing,and HYPERNOVA...GOT IT! ​It is versatile, easy, extremely easy to use if you are obviously familiar with synthesizers language,and it is so good, that I have decided to sell my NOVA Laptop synthesizer. I have been able to reprogram the HYPERNOVA with my own favourite patches,and all smoothly. And if you consider the price of the HYPERNOVA, it becomes just a MUST." Adriaan Baussens / Manu Riga / Twins in Mind: "As an artist I'm always looking for new inspiring sounds but not often inspiration comes out of the box. This is exactly what I love about CL-Projects libraries: Inspiring and warm usefulness. When I start playing around with them, I get lost in time. I received their latest creation Hypernova prerelease for testing purposes . ​As a die hard fan of Novation synthesizers I was very skeptical but the moment i got my hands layed on Hypernova, my skepticism turned into unbelieve. Instant magic happened. It felt like I was playing a Supernova, a synth i know inside out. Its the first time i felt a real novation synth was reincarnated into an editable synth library. Working on my albums , both as Manu Riga or Twins in Mind , i know Hypernova and other Cl-Projects libraries will have a prominent place in my productions. I stand by CL-Projects and their products for 100% 10/10." Daniele Maffei: "REALISTIC POLYPHONIC SOUNDS. I was impressed about Hypernova. The sounds are very real to be compared to a true analog synth." Geni Daltes: "A VERY NICE INSTRUMENT. CL-Projects never fail to satisfy, and this is another one of their great products. Great sound quality, beautiful GUI with easy access to further tweakings. ​Antonio Grazioli: "A COMPLETE RECREATION OF THE SUPERNOVA. I can't believe how faithful this Kontakt Instrument is! Nice and clean interface under which is the heart of the hypernova." Daniel Hogan: "EXCELLENT. A detailed instrument. Very professionally put together." BEL - INCANDELA JLB - FAB: "AN EXCELLENT VIRTUAL ANALOG SYNTH. A very good synth Good filters, good waveform, stylish design. A good programming work will give you great result with original presets and very analogous. I love it"
Nigel Hooton: "SUPERB. Wow - this is such a beautiful sounding synth and possibly one of my favourite Kontakt instruments. It does allow you to really program your sound completely. Although similar to the Novation Supernova I have owned and loved for many years, it is not a complete simulation in a number of ways (eg. no FM controls). Even though it would be nice to have all of the parameters of the original (perhaps these could be in a future update?) this certainly does not detract from the pure enjoyment I get from playing and programming this wonderful instrument." Matthew Callahan: "REAL ANALOG SAMPLES CANT BE BEATEN. One of my favorite plugins, real analog samples cant be beaten, one of my goto kontakt plugins for inspirations." Keith Chalker: "HYPERCOOL. I like this, I can't say whether or not this captures the character of the original, as I haven't played one, but it fits with what I've heard of and about it Modern clean sounding but still warm It sits well in a mix and plays well with others digital or analog Nice effects also. "re to edit. Andy Mollard: "WOW! AWESOME SYNTH! This is one of my "go to" synths. It sounds so great and has so many wonderful presets. Love it!" ANDREW VENABLE: "CLASSIC EMULLATION! 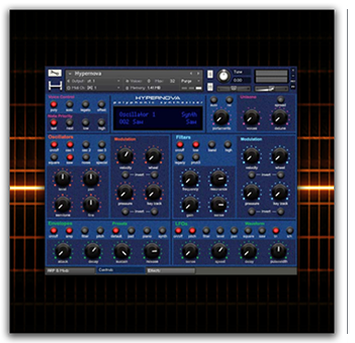 This is a great emulation of the classic SuperNova synth. It was always a favorite and I am happy to own a software version as well!" Dominique D.: "Hypernova among the stars. Really extremely pleased with hypernova synth, which brings the sound I have been searching for many years. The presets sound very usable to my ears, and it is always easy to find how to tune them to my taste. I think cl-projects made an impressive job in sampling the hardware synths and keeping their spirit in that powerful (and low priced) vst. Thanks!" Paul B.: "CL Projects Hypernova. Great Kontakt synth. Nice pads, great editing possibilities esp. with the arp. Certainly worth the full price. A no brainer at the 50% price! Also try his other synths especially if you're into Jean-Michel Jarre-like sounds!" Brian Brylow / Arpegiator / Gorgon Nebula / Parallaxe: "Hypernova is a Monster! Hypernova is an amazing synthesizer that really has a faithful connection with the original Supernova. A truly lush recreation that has allowed me an immense amount of creativity and also the ability to leave the original hardware in the gig bag! Another great creation from Frank and CL-Projects!" Sotiris G.: ​"Instantly inspiring. 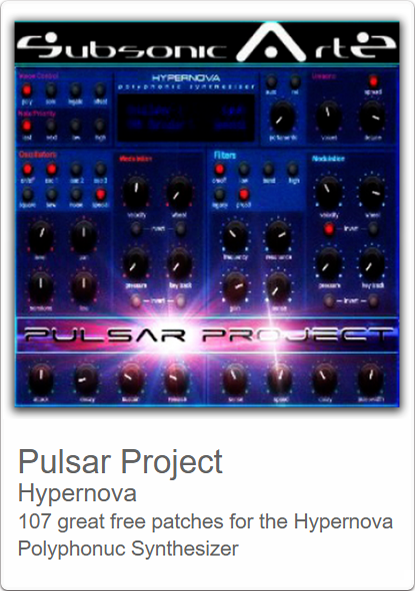 Having also used other CL-Projects' sounds, i bought Hypernova with confidence, and i was (again) very happy. The attention to performance details makes all these sounds instantly inspiring and a pleasure to play. Really enjoyable! " Ceasar G.: ​"Great Sampler. This is a great product. The samples are terrific. This is one of the best Kontakt instruments!!!" Marcin P.: "Good as expected. I make EDM and this synth can add something unique to the track. I`m really glad that I purchased this." Tom B.: ​"Awesome but I expect nothing less. Great product, love this synth and love what he has done with this. Can’t say enough things about his products!" Christian M.: "Orginell. Hypernova ist ein fantastisches plugIn für den jenigen der den analogen sound liebt. (Original. Hypernova is a fantastic plugin for those who love the analog sound.)" "Hypernova by CL-Projects knocked this synth out of this world! Frank Dierickx, the sound designer behind CL-Projects has really created something ultra special. In fact, I have been a huge fan of Tangerine Dream since the early days and before I even read Frank's influences were Tangerine Dream, Klaus Schulze, and others I could hear it in his sound design. Musicians and Composers looking for that beautiful analog sound that is really popular right now, need to check this out. Cl-Projects sell their products via Kontakt Hub, Sampleism and Synthmob but visit his site https://www.cl-projects-sound-design.com/ to learn more. As far as the price goes I would have expected it to be at least double the price however, this synth is only £30.00 or $49.99 U.S. - a total bargain! One other thing I really like, is that the layout of this synth is simple and easy to get around. It's not CPU heavy and loading times are fast so you will get a lot done in a quicker amount of time. This is one of the best sampled polyphonic synthesizers I've ever played. The amount of presets are just epic and the emulation of vintage synth sounds is pure magic."